One of the benefits of joining the American Cribbage Congress is a free subscription to Cribbage World. 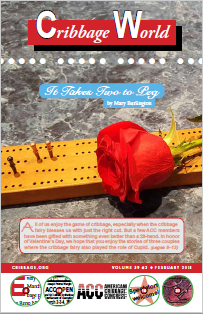 Cribbage World keeps members in touch with what's going in the world of cribbage. It includes recaps of tournaments around the country, schedules of upcoming tournaments, player point standings as well as interesting stats and asides. Now you can also view it in electronic format! Thanks to the ACC's archivist, Fred White, you can now view copies of Cribbage World from past years. If you want to open and view the PDF file below, you must have Adobe Acrobat or Adobe Acrobat Reader installed on your computer. Note: If you do not have Adobe Acrobat Reader on your computer, you can download Acrobat Reader here.